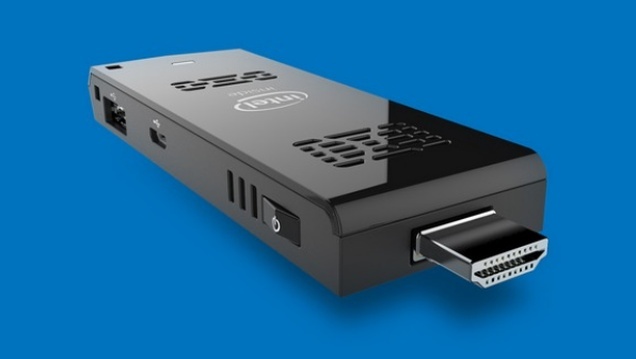 This is the Intel Compute Stick, a humble HDMI USB stick that houses a full desktop computer experience. It’s not a particularly powerful one (quad-core 1.33GHz Intel Atom processor, 2GB of RAM, and 32GB of solid state storage) but it does have Wi-Fi, Bluetooth, and both a full-size USB port and a microSD card slot for expandability. As long as you’re not gaming and find yourself a decent couch controller, you could probably do quite a bit from this tiny PC! More likely, it’ll find a home in small businesses, schools, and for startups who want to give out cheap computers to their employees, since all you need is this stick, an HDMI monitor and a couple peripherals to get things started. Remember when the tiniest PC was a nettop that hooked onto the back of your monitor? Now they come in USB-form. If you’re feeling brave, you can actually already buy one of these tiny USB-PCs from Chinese resellers, but it probably won’t come with Windows on board. Wait for the official Intel version to arrive. The Wall Street Journal says it’ll hit by the end of Q1, with a Linux version also available for $90.